Gee Gee Wong is the Associate at the Nautilus Institute for Security and Sustainable Development, is currently based in Beijing, China. Gee Gee is the Nautilus Liason for China and greater Asia. Her responsibilities include producing and editing the Daily Report and the Week-in-Review of the Northeast Asia Peace and Security Network (NAPSNet). 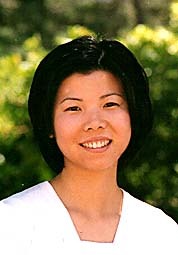 She is a contributor to the China section of the nuclear tables in the forthcoming SIPRI Yearbook 2001. Gee Gee received a B.A. in English and Sociology from the University of California, Los Angeles (UCLA) in 1998. Gee Gee joined the Nautilus staff on October 27, 1999. For more information, send email to GeeGee@nautilus.org.